We waited by the train tracks in the pitch black of the night. “This is like a third world country,” Joel remarked as the shuttle bus dropped us off. It was anything but glamorous. Those who catch the westbound Amtrak Southwest Chief at Williams Junction, Arizona do so as if they were hobos hitching a ride. You wait by the tracks in the middle of a quiet pine tree forest and sometimes the wait can be long — “hours long” — confessed the shuttle bus driver, who stayed in radio contact with the train. Luckily for us, the Chief was running just a few minutes behind on this night, but it was still quite eery to be waiting in the woods with no sign of civilization for miles. No station, no depot, no benches, not even a single overhead structure for shelter. On the opposite tracks, heading east, freight trains whizzed by as we looked down the tracks in hopes of spotting Amtrak’s oncoming lights. It would be almost 11 p.m. before the train finally arrived. We wearily climbed aboard and took the first available seats we could find. The train was fairly full and I was surprised by the roominess of coach seating. There were sleeper cars available, at a higher cost, but the standard seating was more than adequate and plenty spacious. Joel drifted off to sleep not long after we got settled in. I dosed off for a while and awoke when the train stopped in Needles, California. I tried to go back to sleep after that but couldn’t, the excitement of Los Angeles was building. There were several more stops before we made it to our final destination of Union Station. I was amazed at the urban sprawl, picturesque mountains and the appearance of largely latino communities as we rolled through the San Bernardino Valley. By the time we reached Los Angeles, the sun was rising and most of the train had emptied out. Joel slept the entire way. At Union Station, we met up with the other guys — Jastine and his twin brother Normen and Cheng Yew, who had assumed the driving responsibilities. I snapped a few photos of Union Station, the lobby area in particular had a nostalgic feel to it. You could sense this was a bustling place before air travel became the norm. The guys appeared surprisingly refreshed for having just bused in from Las Vegas. Jastine was the leader and he had arranged for a rental apartment in Hollywood. And it was pretty sweet. Not overly luxurious, but definitely a cut above the Holiday Inn and if location meant anything, our headquarters for the week was prime real estate — situated directly across the street from Paramount Pictures Studios. 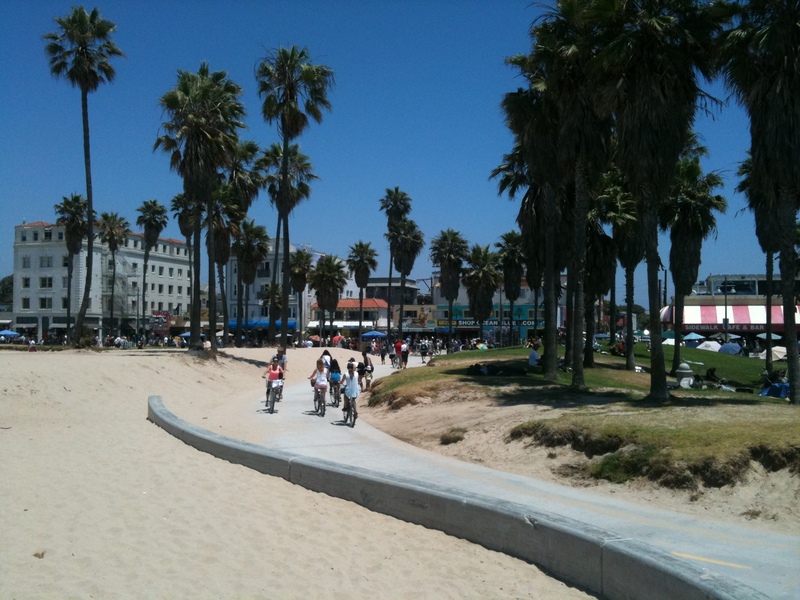 We stopped at the apartment just long enough to unload our luggage and then it was off to Venice Beach. Cheng Yew managed the traffic well and we arrived early enough to get a pretty good parking spot. Right away, I noticed this would not be like a Florida beach experience. Cyclists enjoy the ride at Venice Beach, California. 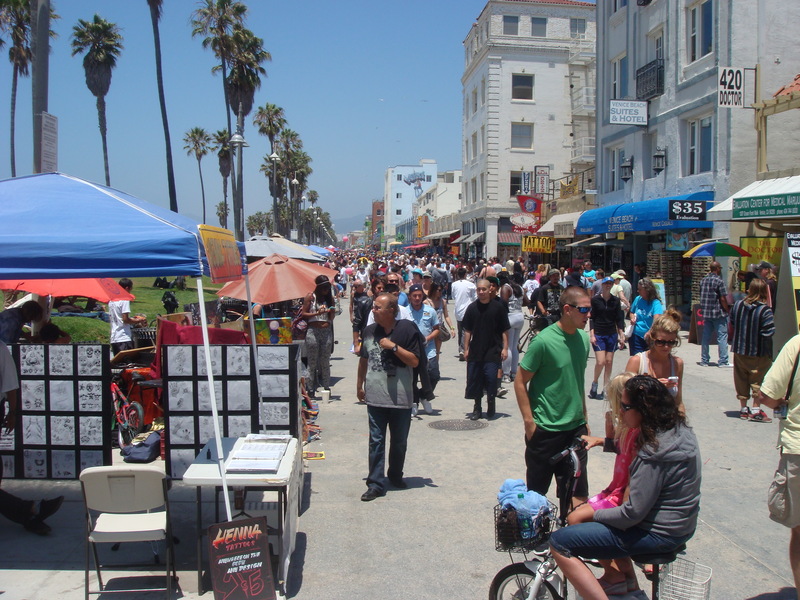 Unlike Panama City, where greedy developers built towering condominiums that block much of the public access and views of the water, Venice Beach was obviously designed with the pedestrian in mind. Nestled by the beach is an athletic oasis of basketball, tennis and handball courts, gyms, skateboarding pits, bicycle routes and jogging paths. And not to be left out, American consumerism lined the nearby streets with shops from high-end retail to fly-by-night gypsies waiting to capitalize. And we were eager to dive in, starting with a quick bite to eat at Jody Maroni’s hot dog stand, but before we could finish our dogs, a foul smelling panhandler approached and asked for some money. I offered to buy him a Maroni dog, but he said he wasn’t hungry. Guilted, I parted with some spare change, while the guys ignored him and he meandered on. “You’re going to get that a lot in New York, fellas,” I warned them. Refueled, we continued down the ocean front walk, snapping pictures and soaking in the atmosphere. It was a beautiful Sunday afternoon. Under clear skies, throngs of people from all walks of life had converged on Venice Beach for some fun in the California sun. It was hard to believe just 24 hours ago, Joel and I were in the Grand Canyon. The others didn’t say much about Las Vegas, honoring the code of what happens there, stays there. But as we made our way down the boardwalk, an odor engulfed us all. I knew right away what it was and Normen did too. “I smell weed,” he said. To me, the most remarkable thing is the blue sky in the pictures. Haven’t seen much of that in Michigan for a while (although the past couple of days have been nice). Hahahaa…this sounds like fiction. I love your real life and I love this blog. And I envy your adventure. Lead on – waiting to hear what’s next!! !